Winter Saturday. Watercolor & Crayon. 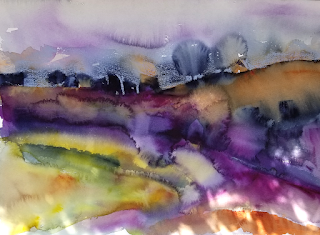 Just under 15 x 22 inches. Yesterday it was cold, gray and snowy. Miserable. Today it is beautiful, and we're talking about grilling for dinner. The weather is moody, and it is making it hard to finish my painting. It's not a great photo--there were a lot of dapples in my space (the nerve of the sun casting shadows). Quin orange, indigo, quin purple, and hansa yellow medium with a little crayon above the horizon line. You can see this painting before I added the crayon here.